When an organisation has been in existence for a long time, it’s easy for it to lose sight of its priorities – what it was set up to achieve. It can get so consumed by its day to day activities that it loses sight of what it is there for – the vision that created it. Last Saturday some members of our church council met to reflect upon the vision for our church. Vision can be a hard word to get your head round – it’s like a slippery bar of soap to get hold of. What does it really mean, and how do you get a vision? A friend of mine has a great definition for vision for organisations and groups. He says vision is the ability to remember the purpose of the work. What are we really here for, and how do our plans and ideas line up with that? It’s a wonderful coincidence, therefore, that today’s passage is all about the fundamental purpose of the Church. You may remember that in Matthew 28, at the end of his ministry on earth, Jesus tells his disciples to go and make disciples of all nations. It’s the great mission statement for the whole church. And here in this passage at the start of his ministry, we see the first people become disciples. But what is a disciple? Aren’t they specially qualified expert? Well, no they’re not. The word disciple means learner. A disciple is not a finished product. They are people who have decided to follow Jesus, to learn from him, and to get to know him better and that is a lifetime’s process. You and I, if we call ourselves Christians, are all disciples. That’s not being presumptuous, it’s saying that we don’t know it all, but we have decided to follow Jesus, and we’ll spend the rest of our lives learning what that means. Now our passage naturally splits into two halves – the first half is about the one we follow, and the second half is about following. The passage is packed with titles for Jesus – Lamb of God, Son of God, Rabbi, Teacher, Messiah, Christ. There’s a lovely 35-40 minute sermon we could have on that, but I’ll spare you this morning! John the Baptist uses two crucial titles here, which explain why Jesus is a compelling person to follow, and why his command through the ages to us to help others to become disciples is worth attending to. “They’ve never done a proper day’s work”. What they’re saying is that the person hasn’t stood in our place, felt our pain, experienced our hardships, walked in our footsteps. John here is making the amazing statement that God is indeed doing that – he is standing in our place, feeling our pain, walking in our footsteps, because he has come in Jesus. And he knows Jesus is the Son of God, because he has witnessed the Holy Spirit descend upon him. But at the beginning of this passage in verse 29, John said something else which is also amazing. Here is the Lamb of God. Lambs were slaughtered in the Jewish religion. At Passover it would have been on an industrial scale. Sacrificed lambs were either burned as sacrifices, or at Passover eaten as part of the sacred meal Jews share in their homes for that important festival. Either way, it is a reference to sacrifice. He’s saying that God through Jesus will go to any lengths, even suffering and death, to open up his love for us, to reassure us to our value to him, and to make his love known. Any lengths for us to become his friends. Now I think that is a very compelling opening for any group of Christians to start thinking about vision. Then in part 2 (verses 35-41) people actually become disciples. Now when people like me start talking about faith-sharing, or to use that big scary word evangelism, my hunch is that many of us here might want to opt out in our heads in some way. “I’m not academic”, “I’m not clever”, “I’m not outgoing”, “I’m not good with words”. I’m not a gambling man – I’ve never even bought a National Lottery ticket, but I would bet that everyone here has a friend. Yes? I bet that at some point you have introduced someone to a friend. Bert, I’d like you to meet my friend Sid. Beryl, come and meet my friend Cynthia. And you get chatting. How long have you been friends? Where did you meet? Were you at school together, etc. Look at this passage – it’s not in a religious building, and it’s not at a religious service or ceremony. No Temple, no synagogue, no church, no cathedral. John says – look here is the Lamb of God, and the two follow Jesus. Well it’s all right for John, he’s a bit special. But look further down. All Jesus does is ask them to come along to where he is staying and spend time with him. And one of them was Andrew. Now we know Andrew is just a fisherman – no theology degree, no clever words. All he does is go to his brother (Simon, who is renamed Peter, by the way) and brings him and introduces him to Jesus. If any of us can introduce someone to a friend of ours, then we’re already most of the way there. Sharing our faith is simply introducing someone to a friend of ours – Jesus. When I was a teenager, I wasn’t a natural churchgoer. I wasn’t interested in going to church for its own sake – although I know some people are for the music, or the social life. However in the youth group I went to, people introduced me to Jesus as a friend – by talking about their experiences, their answers to prayer, by grappling with the Bible stories about him, by sharing their questions, their struggles and their joys. I met people whose lives were informed by, inspired by, and shaped by the life and teaching of Jesus and that – He - excited me. They showed me uncommon generosity and hospitality, which surprised me and made me wonder why that was. That’s when I started attending church regularly, because I wanted to share fellowship with others who followed him, and learn alongside them. It wasn’t always easy (still isn’t! ), but I knew I needed to be there. Someone had introduced me to their friend. So, today’s reading asks us all firstly whether we are disciples. In other words, are we people who have decided to follow Jesus and who are engaged in a lifelong journey of learning about him, getting to know him better, and living lives inspired, informed and shaped by him. That’s quite personally challenging. And if we are, then we are called to introduce others to this person who has become so important for us. And the test of any vision we might have for our own church community is that it serves these aims – does it help us to be disciples, and does it help others to become disciples. And if it does, it will change us, our church, our community, and possibly even the wider world. It would be hard to escape the images of Aleppo in the media this Christmas – even if we wanted to. And I think this tragedy which has unfolded before our eyes in Syria has a lot of connections with the Christmas story we’ve had read to us this morning and during the week. Firstly people on the move. Tens of thousands of Syrian civilians - men, women and children - with all their belongings on their backs or on carts, waiting for evacuation from the war-zone that Eastern Aleppo had become. Sleeping in the open in freezing temperatures, hungry, anxious and fearful. It would have been very similar 2000 yrs ago though the scene is not usually depicted like that on Christmas cards. 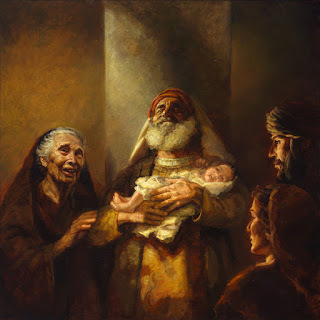 Joseph and his pregnant fiancée Mary would have been on the move with thousands of others, carrying all they needed for the long journey, jostled by the crowd, sleeping out in the open in the cold. Anxious that she didn’t deliver her child till they reached safety. The second thing these different times in history have in common is tyrannical leaders. The Caesar at the time of Jesus’ birth, Augustus, and his Governor of Syria (note that!) Quirinius have rather a lot in common with the current President of Syria, Asad and the president of Russia, Mr Putin – the desire to dominate and subjugate, caring little for the consequences of a decimated landscape and ruined lives. Thirdly, what is striking in the Christmas story is still found in our world today – the lack of welcome to those in dire need. In Joseph’s case, he found no room at the Inn. Whether you imagine that to be in an outhouse of a local hotel, like Ebenezer’s Inn at our Crib Service last night or, as was more likely, in the space under the house of relatives where the animals were kept warm and safe - because their guest room was full; this couple of dubious morals were not made to feel welcome when Mary was about to give birth to her firstborn. It is incredible to me that we haven’t allowed that story of un-welcome to pierce our consciences more. Instead, this year the political shifts in this country and the USA have been marked by so much suspicion and vilification, of the immigrant and refugee – the innocent victims of war. Have we forgotten that Jesus was a refugee in Egypt when he was about 2 years old? If all that sounds a bit depressing on Christmas morning, it is; I make no apologies. We can only really celebrate Christmas, God come among us, if we see what he needed then, and needs now, to come into our world for. There is light in the darkness, hope in these familiar stories. There are always some of God’s children who are willing and ready to recognise God’s visitation. The Shepherds – those at the bottom of the social pile in Jesus’ day - were the least likely in anybody’s mind to be visited by an angel choir and a display of the glory of the Lord! The description has echoes of the glory of God filling Solomon’s Temple 2000 years previously. And it’s happening again but this time out in the fields to these unprepared humble shepherds. But the Shepherd’s didn’t just sit there and revel in the privilege of such a revelation, they got up off the ground and acted, moved, ‘went with haste to see for themselves’ what it was all about. And we have seen action in the most dreadful situations over the last weeks and months in Eastern Aleppo. The White Helmets risking their lives to dig people from the rubble after yet another bomb blast. Doctors continuing to tend the wounded with virtually no medical equipment after all their hospitals have been destroyed. People of good will campaigning, urging our politicians to do all they can to broker peace, and many all over Europe and the UK, including Lancaster taking refugee asylum seekers into their homes. Light, hope, action, peace - demonstrated in the lives of the most ordinary, in the most unexpected quarters – showing that God has come to live with us, to be with us in our mess. Let us set a place at the table of our hearts for a refugee this Christmas – it may turn out to be Jesus.